Productive Much? Let’s Share What’s Working – Part III: Swimming in the Internet Sea | Do I Look Like A Writer in This? This is the third in a 4-part series on the tech tools I’m using to help me be more productive. If you read yesterday’s post on taming email, I’ve added an important clarification about the use of labels in Gmail that you may want to check out. The internet is amazing because it contains so much accessible information. The internet is maddening because it contains so much accessible information. I have a few tools I use as a kind of life raft to guide me through the Sea of Info. You can zip through each story by scanning the headline and then hitting the J key to go to the next story. Moving too fast? Hit the K key to go back. Feedly lets you click on the headline to get to the website but doesn’t disappear. It just opens a new tab in the browser. It also has a Preview function that lets you see the content from within Feedly. You can share content via email, twitter, or Facebook. And you can save it to either Evernote or Pocket. The screen shot below shows you the left column of my Feedly account. I have 150 unread stories, and you can see how they are arranged into categories and individual sites. Newsletters inform me of things I might like to read: I subscribe to a bunch of these that the NY Times produces (Personal Tech, Boomers, Movie Reviews, What We’re Reading) and also receive a daily digest from The New Yorker (both require a subscription). Also, if you use Pocket (which I’ll talk about in a minute), you get a periodic email letting you know about articles you might like to read. So, Cindy, when do you find the time to actually read that stuff? Well that’s where Pocket comes in. 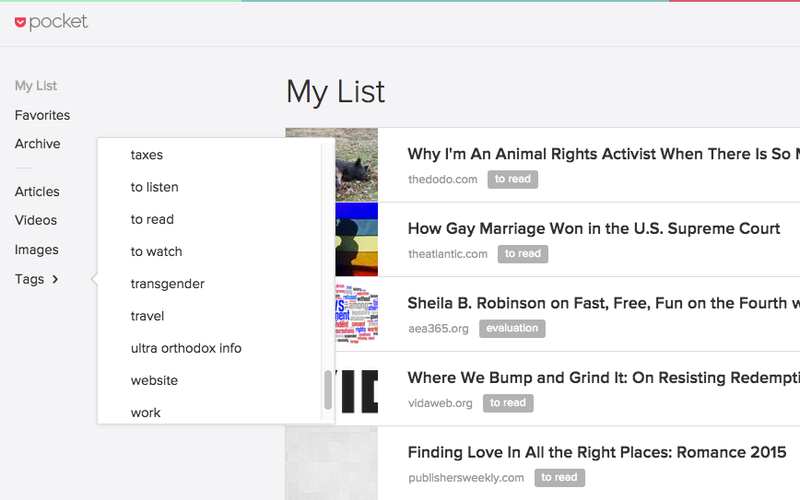 Pocket lets you store the stuff you want to save for later and tag it into categories. Pocket can be accessed on your computer and any of your mobile devices. When I’m sitting in the doctor’s office waiting for my appointment, commuting on the bus, or needing to kill time before a meeting, I can read all sorts of great stuff I’ve saved using my phone or my iPad. Also, Pocket is a great place to store info from the web that you’ll be using to research a book or for any work-related project. Below is a screen shot of my Pocket home screen with the tag box open. As you can see, the list of everything I’ve saved is there and each item has been tagged. I use the tag “to read” for my own leisure reading. I also have a “to watch” tag for new web series or videos that I’ve come across as well as “to listen” for podcasts. There’s even something called “untagged items” that lets you see which items you’ve saved but haven’t yet tagged. One great thing about reading content you’ve saved to Pocket is that Pocket cleans up the text so it’s much more readable, without the distraction of website ads and graphics. If you want to see the original site, Pocket also lets you do that. There’s a browser extension for Pocket that gets added to the top of Chrome. Anytime you want to save something from the web, you just click that extension and you’ll be asked to type in your tag and hit save. It’s that simple. Also, Feedly has a save to Pocket button as well. In the final post tomorrow (Part IV), I’ll let you know how I organize my notes and content to manage projects and keep information accessible in a virtual notebook. Please, please, please let me know if these strategies seem helpful, are crazy, would never work for you or could save your life. Also, if you have other/better ideas, let me (and everyone) know. This is way cool, Cindy. I’m planning on researching this Feedly. Thanks. I can’t wait to try Pocket and Feedly! Thank you for sharing and for the helpful screenshots.